The Maldives aren’t known for being a budget-friendly holiday destination. 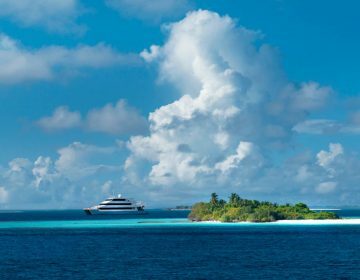 In fact, these paradise islands are home to some of the most expensive villas in the world. But over recent years, many more affordable Maldives accommodation options have been springing up, and there are some great deals to be found – if you know where to look. On top of this, you can also slash the prices of your airfare and room rates just by following a few sneaky tricks. One savvy couple even used one of these tips to get their whole Maldives holiday for free! We’ve done the detective work to reveal 10 tried and tested ways to save you cash when it comes to booking your Maldives vacation. No matter what time of year you visit the Maldives, you will be sure to enjoy lovely warm temperatures. However, the Maldives does have two distinct seasons: the dry season and the rainy season – otherwise known as high season and low season. If you’re looking to save some money off your next Maldives vacation, then you should absolutely book your holiday during the low season which typically runs from around the end of April to the beginning of December. During this time you can expect much higher levels of rainfall sometimes on a daily basis, but the rain is usually nice and warm and tends to pass very quickly. Top Maldives resorts such as the One and Only Reethi Rah have a huge number of wet weather activities, classes, and excursions to keep you happy and entertained when the heavens are open. If you’re a sun-worshipper and have your heart set on going when the weather is at its best, then go in high season but avoid booking a vacation during holiday periods like Christmas, Easter, New Year, and Valentine’s Day. During these times the resort rates skyrocket, and flight prices will be much higher too. There are now over 120 different resorts in the Maldives, each competing for new guests. This means that there are some pretty incredible deals on Maldives accommodation throughout the year, but you do need to be quick in order to snag them. Sign up for the newsletter of your favourite Maldives hotel, as they will often let subscribers know special offers before they are put out to the world. This also applies to social media, so be sure to follow you favorite Maldives resort on Instagram and like their Facebook pages. We can highly recommend that you go and follow Constance Moofushi Resort, and the W Maldives as they have some of the best and most beautiful Maldives content around. 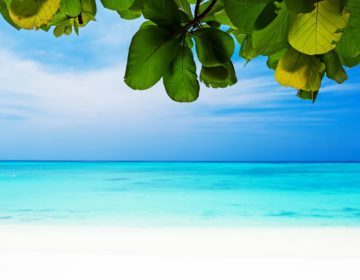 Package holidays are becoming increasingly popular in the Maldives, yet for the very best deals on your vacation then we recommend booking your Maldives accommodation and your flights separately. This gives you a lot more freedom in the type of resort and meal package you can choose, as well as flexibility with when you can fly. If you book a Maldives resort direct, you can often get special offers (and often freebies thrown in too) which aren’t available when booking a package holiday. Another good way to get a great deal is to choose an all-inclusive hotel in the Maldives. The Maldives can be particularly expensive when you book a resort that doesn’t offer any sort of all-inclusive or half board package. This is because of their remote location, and how costly it is to import food and other items to the Maldives resorts. On top of this, the Maldives have a very high import tax rate, hence why everything can be so pricey there. In order to get round this, you can choose to book an all-inclusive vacation. There are some incredible packages around which will save you hundreds if not thousands compared to if you were to purchase all your meals, drinks and snacks separately. Some of these packages are very generous and also include things like free massages, premium alcoholic beverages, as well as free watersports hire to really make it worth your while. As always, make sure you check the small print of your all-inclusive package so there are no surprises on checkout. 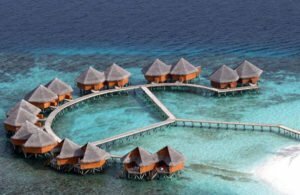 If you’re looking for an exceptional value Maldives resort that offers an all-inclusive package, then check out Gili Lankafushi. If you are vegetarian or vegan and after incredible plant-based food and the best hand crafted cocktails around, then you’re going to love the food on offer at Atmosphere Kanifushi which has all-inclusive options too. And if you need a little more inspiration on where to stay, then check out this article where we list our favorite resorts in the Maldives. Did you know that seaplane transfers can sometimes cost the same amount as your international flights to the Maldives? Yes, it can be quite a shock when you’re presented with the cost of your seaplane ride….but there is a way to get round this, and that is to choose a resort which can be accessed by speedboat. You may miss out on the wonderful views from the seaplane but a speedboat transfer can be quite the adventure too – it’s a fraction of the cost of flying. Look for Maldives resorts that are located much nearer to the main island of Hulhule, where your international flight will land. 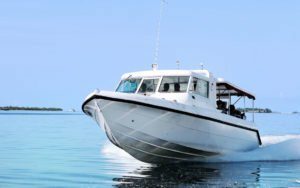 A resort that offers speed boat transfers is the One and Only Reethi Rah. You may actually be able to save some extra money by choosing to book a multi-stop vacation. You can add a little extra spice and adventure to your getaway when you choose to make a pit-stop on the way at beautiful destinations like Dubai , Sri Lanka, India and Bali. 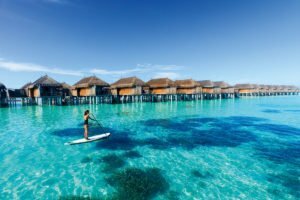 By splitting up your vacation into these different spots you can save money on a more expensive Maldives getaway, plus you get to explore different cultures and continents too. This is a particularly popular option for those on a honeymoon, as you can mix-up a chilled beach getaway with a glamorous city break. 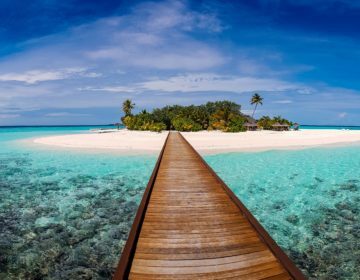 Try Skyscanner’s search feature to look for multi-stop flights, which can cost less than direct flights to the Maldives. Flights can take up a huge portion of your Maldives budget, Luckily there are quite a few clever ways to save money off those airfares. We recommend using Skyscanner and being very flexible with your dates so that you can search for flights to the Maldives over a month period. This allows you to really scout out the very best deals on Maldives flights by looking at an easy to view fare calendar. You can also try looking for a stopover on the way (or searching for fuel dumping fares), and choose to book the two separate legs of the flight separately. For example, you can type in your starting point into Skyscanner and then type ‘everywhere’ into the destination box. Skyscanner will then present you with a list of options and you may be able to find very low cost flight to a destination that’s pretty near to the Maldives. From then you can book your second flight and save money. Studies show that the lowest priced flights actually depart on a Wednesday, so look at leaving midweek instead of at the weekend. Airlines are actually pretty sneaky with the way that they market and advertise their flights, and they can actually push prices up based on the location that you are searching from. In order to get around this, you can use a VPN to disguise your location from the airline company, and possibly receive a lower priced flight option. You can also try searching on different third-party airline comparison sites that are located in India and Asia, as these often display lower prices for the same flights that are listed on the American and English versions. 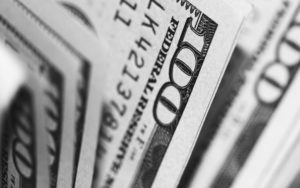 Have you heard of Cashback sites? They are a very popular way to save money off things you purchase online including flights and accommodation. They’re free to sign up, and very easy to use. How it works is that they give you the percentage of the cost of your purchase that would normally be given to an advertiser. 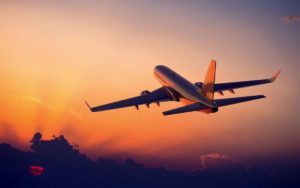 This can be anywhere between 1% and 10% of your total purchase price – with flights typically lower at around 1% to 2% mark. This may not sound like a lot, but say you’re travelling with your family and your flights come to $3,000, that means that you will receive $60 cash back if the cash back rate is 2%. When you start using this for all of your online purchases it can actually add up to a decent amount. We recommend using a reputable cashback site such such as Top Cashback. Did you know that there was a couple that got their Maldives holiday for free by using travel points? Pretty smart right? You can check out the whole story here. While it may not be feasible for you to save enough points for a free vacation, you can certainly use your existing Airmiles and points towards your Maldives holiday. Perhaps you want to upgrade from economy to business class, so that you can really travel in style to your Maldives resort. 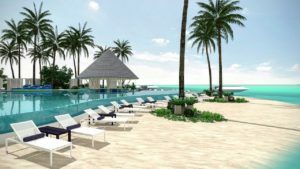 Many resorts also operate on a points scheme, such as the St. Regis Resort and W Maldives, where you can redeem points and use them to stay at these destinations. This is a great option if you stay in a lot of hotels for business, as you can transfer your points to your holiday. Many people are quite surprised that the amount of Airmiles that they’ve logged up, so why not go head over to your account now and see how many points you have and if they can be used for your Maldives vacation (before they expire). The same applies to other points aside from Airmiles. Did you know that your supermarket, gas station and clothes shops all probably have a rewards scheme, which can often be redeemed on hotels and flights? If you really want to put in a little extra work to save some extra cash on your vacation, they look into what schemes are offered and how you can start collecting points when you shop both online and out and about. And last, but by no means least is an important factor that needs not be overlooked, is that you really do have to pack wisely when it comes to a Maldives vacation. Many Maldives resorts will often have an island store or clothing boutique, but these will often have sky-high prices where you can pay over 500% more than what you would pay back home. This is again because of the import taxes, but also because Maldives resorts know that you have no other choice and there is no where else to shop So be sure to pack carefully and make sure you have everything you need for your trip before you leave. If you need a little help with this, then check out our ultimate guide to packing for the Maldives to ensure that nothing gets left behind. There you have it, ten simple yet powerful ways to save money on your Maldives vacation. Incorporate a few of the above tips into your Maldives booking plan, and you’ll be sure to see the savings roll in. These only take a few minutes and will save you some nice sums so you can spend more on pina coladas and tropical-print swimwear! Do you have any special money saving tips for the Maldives that are not listed above? Let us know in the comments section below.